Yesterday, we got a lot of work done in our allotment garden and I harvested the remaining tomatoes. The ripe ones went directly to the pot as I used them for this delicious Tikka Masala. As I am mainly eating vegan at the moment, I added some chickpeas for protein. I also made some wild rice with a bit of lemon zest and this was perfect comfort food. Our garden will soon go into winter sleep, but I’ll tell you more about that another day. Okay, now on to the recipe! First you peel the onion and garlic and then finely dice both. Now wash the tomatoes and dice them as well. Next, you prepare the rice. Therefor, put the rice, 500ml of water, a teaspoon of salt and some lemon zest in a pot and bring it to a boil. After that you just let it simmer with the lid put on until all the water has been soaked up. Take a second pot and melt two tablespoons of coconut oil in it. Then add in the onions and garlic and sauté until translucent. Now it is all about the spices. Add in some freshly minced ginger, one teaspoon of each cumin, coriander and turmeric, two teaspoons of each hot paprika and salt and one tablespoon of Garam masala. Sauté until fragrant and then add in the diced tomatoes and the chickpeas with their liquid. Let it all cook until it thickens. Don’t forget to stir your rice every now and then. When the rice is nearly done, add a can of coconut milk to your masala and let it simmer until it reaches the desired consistency. Now your food is ready to be dressed. Just serve it in bowls and add some fresh coriander, if you like to. 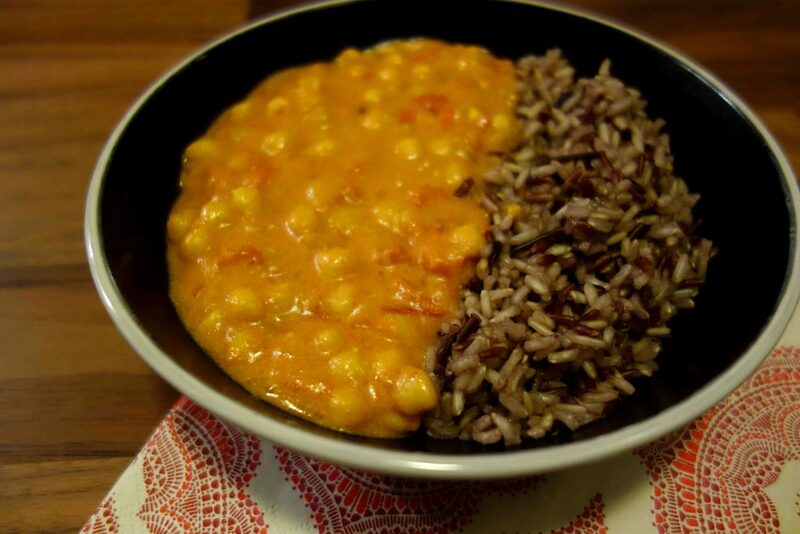 If you are into fruits, you can also serve this chickpea tikka masala with a hot mango salsa.